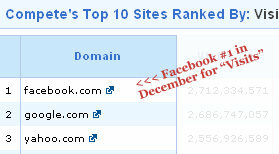 According to the rankings listed on Complete.com, Facebook had more visits in December than any other website on the Internet – including Google! What started out as a project in a college dorm room, has blossomed into the a dominant online empire. Facebook is now the #1 most visited site on the Internet, beating out Yahoo, YouTube, and yes… even Google! If you look at the Alexa rankings, you will see Facebook sitting at #2, and Google at the #1 position. I’m assuming here that Alexa is looking at unique visitors and Compete is looking at total visits. I know that most people visit Facebook continually throughout the day. But that “repeat” visitor element is a huge factor for Facebook, and especially for generating ad revenue. It ultimately means that Facebook is a place that people love to visit, and love even more to come back to see what they’ve missed! You can see the full rankings of the top 500 websites in the world at Alexa.com.